Best use: Excellent external aggressive treatment drops 1 to 2 pints per coat. Track Tac® Topaz will drop the hardness of the tire at room temperature between 5 to 25 depending on number of coats applied. 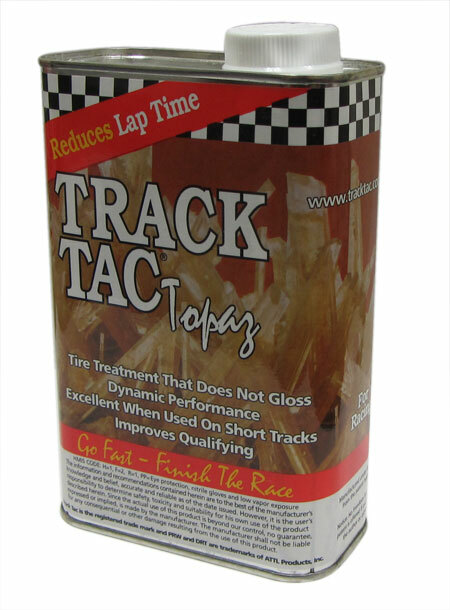 Track Tac - Topaz: Will last for a full night of racing and increase the life of the tire. It also works with both natural and synthetic rubber. Monday: Monday night before the race using a foam bottle, paint roller, sponge, or some other method completely cover the tread of each tire with 3 or more coats of Topaz.